Every so often an email lands in my inbox from a reader enquiring about places to shop ethically in Edinburgh. So, after living in and around Edinburgh for nearly 10 years now, I’ve put together my ultimate Edinburgh Ethical Shopping Guide. I’ve included all of the places on my radar of where to shop ethically when in this fair city. I’ve also gotten all technical on you and made my own Google Map, which should help make it easy for you to locate all of these lovely places. I hope you find it useful! Marchmont based Bohemia sells a small but perfectly formed range of clothing, as well as jewellery and home accessories ethically sourced from artists and craftspeople around the world. Specialising in Scottish design-led craft, Concrete Wardrobe sells high quality clothing and crafts handmade by Scottish based and/or trained designer makers. This cosy little shop in Tollcross sells a nice range of ethical clothing, accessories and gifts. You can visit their website here. Godiva is a funky boutique on West Port, selling a range of vintage and repurposed clothing, as well as clothing and accessories from independent designers, such as Rowan Joy. Hibiscus Flower stocks a range of ethical clothing, from brands like People Tree and Komodo, to smaller, less well known brands. Joey D makes clothing and accessories (and now furniture too) from recycled vintage clothing, and sells them from his Broughton St store. Totty Rocks make all of their seriously beautiful clothing in their Bruntsfield shop from locally sourced fabrics. It takes about 2-3 weeks for your order to be ready – slow fashion at it’s finest. Armstrongs, Edinburgh’s most iconic vintage shop, has three locations across the city – The Grassmarket, Teviot Place and Clerk St. My personal preferences are either Teviot Place or Clerk St. They seem better value than the Grassmarket store, although Grassmarket does have the biggest selection. I haven’t visited Carnivale Vintage yet but I hear they have a cracking selection of vintage dresses. Elaine’s has a wonderful carefully curated selection of vintage clothes, and Elaine herself is very helpful and knowledgable. Herman Brown is a delightful wee vintage shop in West Port. If you’re in the Portobello area then Martha’s Attic is handy for popping in to for a browse. Miss Bizio’s is a Stockbridge based shop focusing on vintage pieces from designer brands. Another one that I haven’t visited yet, Pi-Ku Collective, just off Grassmarket, is definitely on my radar. An intriguingly named vintage shop on Easter Road. I haven’t visited Those Were The Days but I have heard from various sources that they have an amazing selection of vintage wedding dresses. Breadshare is a community supported non-profit organic bakery with an impressive zero waste policy. Dig-In is a community-owned and supported, not-for-profit greengrocer who supply locally-sourced produce and provide volunteering opportunities for the local community. Earthy sell local and organic fruit and veg, as well as other groceries, wines, beers and personal/household products, including Ecover refills, from their 3 shops around the city – Causewayside, Canonmills and Portobello. Social care charity Garvald have an onsite Garvald Bakery, which sells a wide range of organic bread, rolls and cakes, where profits go back in to their main work of supporting people with learning disabilities. Members are involved in baking, packing and delivering orders and there’s a really lovely video if you want to find out more about their amazing work. Holland & Barrett, the high street staple, has six stores in Edinburgh – Princes St, Rose St, Nicolson St, Shandwick Place, Ocean Terminal, and The Gyle – so you’re well served for vegetarian and vegan food stuffs, and bulk buys of nuts and other dried goods. This Nicolson St shop is a bit of a goldmine for vegetarians, vegans and anyone vaguely health concious. The shop is literally packed to the rafters – the friendly owner is always up his ladders retrieving things that customers can’t reach! I’ve particularly found that for pulses and grains, and things like spices and specialty teas (all the specialty teas – apparently the biggest tea range in Edinburgh) –the prices are often cheaper than anywhere else. New Leaf Co-Op is an employee owned vegetarian shop where you can scoop and refill dried produce such as nuts and pulses, getting a discount if you bring your own container! They also stock, where possible, local produce, such as bread, honey, eggs, fruit, vegetables and more. Real Foods has two locations in Edinburgh – Broughton St and Tollcross. Broughton St is the largest, however the Tollcross store is a bit of a rabbit warren! Here you can pick up all sorts of vegetarian, vegan, gluten free food stuffs, as well as organic fruit and veg, and beers and wines, as well as eco friendly cleaning products and personal care products. Tattie Shaws is a good old fashioned independent greengrocers with locally sourced stock where possible. Armchair Books is a secondhand and antiquarian bookshop on West Port. Edinburgh Books has a vast selection of secondhand books in it’s warren of a shop! The Edinburgh Bookshop is a lovely independent bookshop in Bruntsfield. Golden Hare Books is an independent bookshop in Stockbridge, open 7 days a week, offering free coffee for customers, a 10% discount for students, and they run a monthly book group too. McNaughtan’s is the oldest secondhand bookshop in Scotland, and also has a nice wee art gallery attached to it. The Old Town Bookshop sells rare and secondhand books on picturesque Victoria St.
Tills is a really lovely little secondhand bookshop. My top tips is to buy a book from Tills, and then walk across the road to the Meadows, and sit in the sunshine reading. A perfect afternoon if ever there was one! Word Power Books is an independent radical bookshop and publisher specialising in modern politics, socialism, radical history and more. 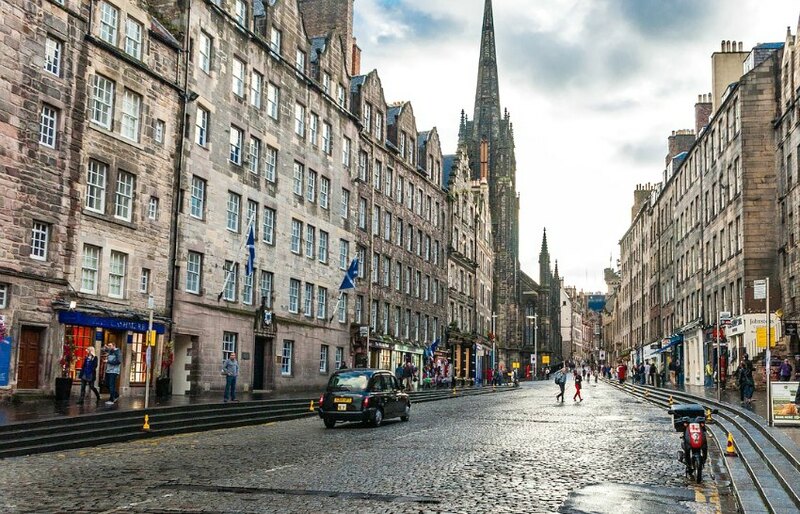 Curiouser and Curiouser have two sites across Edinburgh – one on Broughton St and one in Bruntsfield. Supportive of local designers, the majority of their stock is sourced from British designers and artists, and they also stop ethical homewares brand Nkuku. A funky little gift shop on Bernard St, Flux say that anything not made in the UK will be sourced from only the most ethical of overseas companies. One World Shop is probably one of Edinburgh’s oldest ethical shops, and has temporarily moved from it’s St Johns Church location to Nicolson Square. They sell a wide range of fair trade products, and is great for unique gifts. The Cat’s Miaou sells a mix of fair trade, ethical and locally made gifts. Hannah Zakari sell jewellery and art from independent designers. Their Grassmarket shop is always an absolute treat to visit. Just up the hill from Hannah Zakari is the lovely Red Door Gallery, again selling art and jewellery from independent designers and artists. Another treat for the eyes. Bra Bohag sell mainly secondhand Scandinanvian/mid-century furniture. Soul Cycles sell refurbished secondhand bikes (as well as new bikes). The Bike Station sells refurbished secondhand bikes, secondhand bike bits, and can even teach you to fix your own bike. In need of a secondhand buggy? The Buggy Repair Centre will sort you out. Got a broken buggy? Again, they’ll sort you out! The Edinburgh Remakery sell refurbished IT equipment and secondhand furniture, and on top of that can teach you how to sew, mend and fix computers! Causewayside based Vintage & Reclaimed, sell, as the name suggests, vintage and reclaimed furniture – beautiful pieces of furniture at that, all sourced and made in the UK. Please note, I’ve not included charity shops in this Edinburgh Ethical Shopping Guide, as the excellent Changeworks have already put together an Edinburgh Charity Shop Map, and I didn’t want to replicate their work. Edinburgh also has a lot of charity shops and I thought it might overwhelm the map! This guide and map is definitely a work in progress, so if you can think of any to add then do let me know in the comments below!